South Stack Cliffs Clever Choughs! 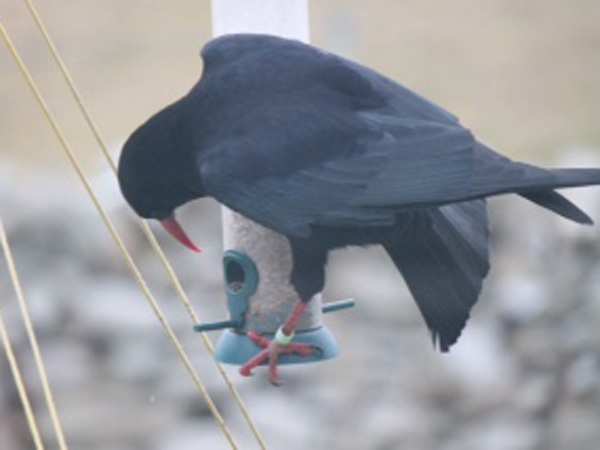 Recent visitors to South Stack may have seen a pair of choughs feeding right outside the cafe window. These are the 'Mousetrap Pair', so named as they nest on Mousetrap Buttress. Their nest can be seen on a live camera feed from the visitor centre. The male bird has learnt how to feed from a feeder containing sunflower seeds; the female waits on the ground for any seeds he knocks out of the feeder. So far, only the Mousetrap male has been observed exhibiting this behaviour! Thanks to Hayley Baker for the photo.